Yes, on Friday I’m done with Insurrection questline – Mayluna blasted through it shifting in and out Balance and Feral forms, and so all the toons made it to the secret entrance. It was a great relief actually. I’ve covered the main plot chapters for every toon, and so they are feeling free to do something else now. So that I didn’t accidentally start to like world quests, Blizzard threw in a WQ week like on purpose. This means 240 WQ to be performed during 7 days! And it must be done, because my toons are barely scraping the last 100 resources for the artifact token missions. Tip: to drive your alts through WQ week fast and easy, don’t complete them one by one. Choose the easiesr quests and do them on your alts, wait for the next day, repeat. If you try to do 20 quests on one alt in one seat, you’ll have to crawl into well-hidden places, waste much time and effort, and end up exhausted. 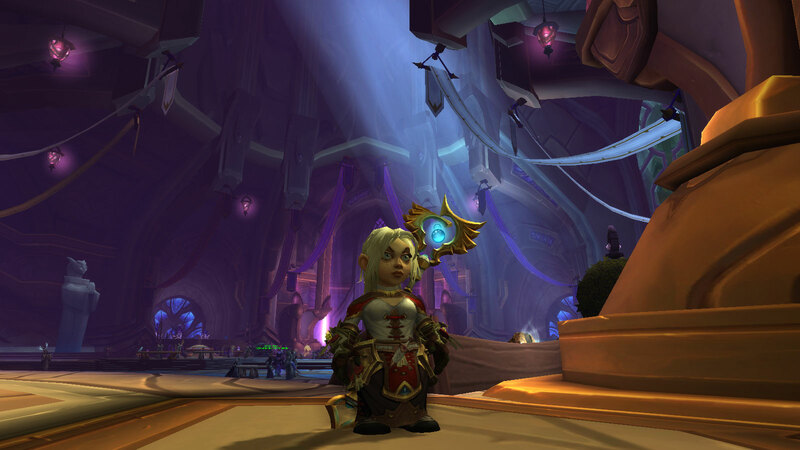 I’ve already wrote about my frustration: once I finished the transmog quest for 1000 soul shards, I got the ugly brown model set from Normal raid as a reward, and didn’t get beautiful dark blue LFR cloth models. Well, something really strange but cool happened. I went to Trials of Valor with another cloth toon yesterday – who doesn’t even have this quest now. 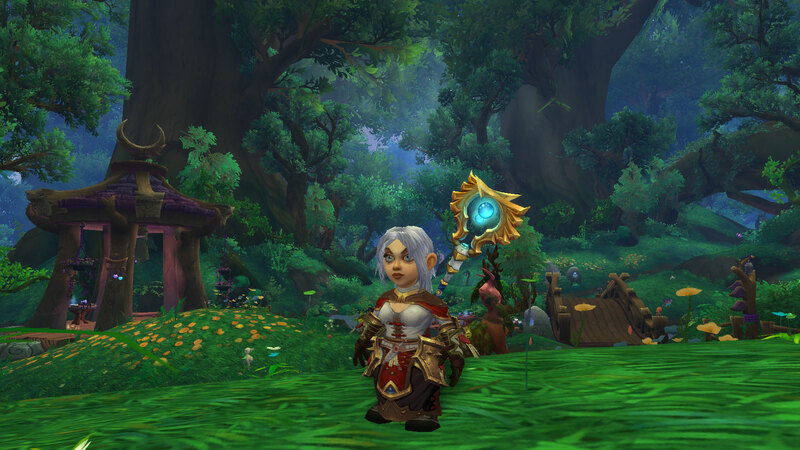 And Odyn drops a full LFR model set for her – yes, the dark blue one! I guess it’s awesome. I need to check how this works on other armor types too. This means a lot less runs then. Probably there is no more frequent line in my blog than “I – don’t – heal”. That was true until yesterday. Well, I’ve tried some healing before. Mayluna the Druid was a healer for 1-64 levels. 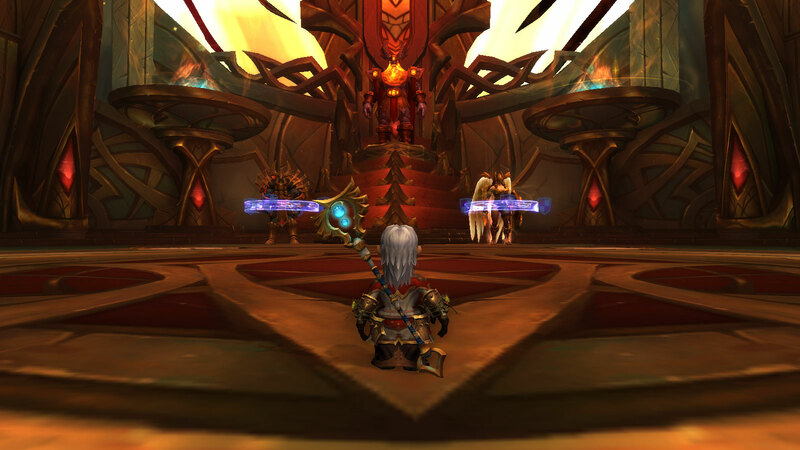 I’ve also obtained all the artifact healer weapons – which was a disaster. But never say never. Aurinko – as her name suggests (“Sun”) – was destined to try a bit healing ever since she was named this way. I went for Emerald Nightmare first, cause I needed some cloth mogs there. Bosses pop like balloons nowadays, so why not try? I’ve read the TL;DR section at Icy Veins, which gave me the basics. Placed the talents at my bars, juggled them a bit, and went there. Healing EN was not difficult. In fact, it was a piece of cake. Okay, let’s do Trials of Valor – with all their heavy mechanics where people still die. Nailed it. And yes, Odyn gave Aurinko that well-earned LFR model set! Still not believing it’s happening, I queued for the current raid, the Nighthold, which is not overgeared yet, and people tend to wipe on Tichondrius because of low DPS and his enrage. My artifact traits on healing weapon are 34 now, so I didn’t have even this 5% boost. It was awesome. I was perfectly aware of what I’m doing, I got full control of the situation, and I’ve finished all the three wings as a healer. For the first time in my life I was healing in raid environment. Those robes I went for in EN – they dropped yesterday, and right in time! It’s a relaxed activity. Much more relaxed than DPS, or the most stressful – tanking. While as a DPS you are pushing everything you can and frantically tracking the boss’ health, a healer would suddenly see a boss fall and be very surprised about it. Is it already dead? Nice! Yes, you don’t see the battle field. Your concerns are health bars, and you see nothing that’s happening there – nothing. If you want to see the majestic encounter in all its beauty and designer’s glory, you’d better come as a ranged DPS. This knowledge also lets you to know what is happening to your wards: prepare for their possible failures and injuries, and see where you could do something – and where it’s just impossible. In fact, healers probably know the best how others are performing during an encounter. I see everything that’s happening: who failed to follow mechanics, who just lingered, I see everything. I see everyone’s skills, be it tanks, healers or DPS. T.ex., one of our tanks – the monk – was toxic and offered to kick a bear druid because monk had too many stacks at Krosus. I pointed out that those stacks were quite heal-able, but he himself died not for the stacks, but by falling off a bridge. Twice. Count to three, would you? One of my fears was also coordination between healers. It happened to be very easy too. I don’t use addons, and the basic interface appeared to be quite enough and essential to perform the healing role successfully. It shows buffs and debuffs, it shows who and how is being healed at the moment, finally, you can see which one you cannot reach. I didn’t run out of mana except once – it significantly drops if you start spamming AoE, which happened only at Spellblade Aluriel. All in all, I see any health bar which is not 100% as a personal insult, and I try to keep it as such. If people follow the mechanics, we keep and end up like that. I may remember much more, cause there is a ton of fresh impressions. But let’s leave it until next time. Conclusion is that now I want to try more raid healing – as a relaxed role, and the next to try is probably will be my shaman. Gnomes are not too religious and are very practical. So they’re not zealous and they don’t plunge into the depths of Holy Light pathos. I’m glad to consider and roleplay Aurinko not as a freaking priestess-who-calms-and-soothes-and-spirit-and-heart-and-soul. Neither of that. Grats on you achievements! :) I’m trying out healing for the first time in my WoW life and it’s definitely not a relaxed role for me, I still get so nervous and anxious when people are dropping health. I guess the relaxation comes with experience. Your observations on healing are great and so accurate regarding being surprised the boss drops because your focus is on the health bars. And you sure do get to see instantly who can do what mechanic because the hits to their health don’t lie. Funny enough when I took an alt into EN to dps in a raid for the first time in ages, I thought that role was easy; there’s no stress and constantly watching bars and all you do is stand and attack. No scrabbling and clutch healing and banging my keys to try to push the heals out faster. I guess a change really is as good as a holiday. Tanks are the most nervous role for me, even if it’s sometimes easier than DPS. Damage dealing is… itchy. You try to max out your rotation, it’s a pretty hard work, and bosses try to grant lots of debuff stuff upon you, they do pools, they turn, they summon adds – so you have to deal with it almost constantly. It’s pretty much intense running, especially for melee ones. Although I could be distracted or slack a bit as a DPS. As a healer, I’m totally concentrated, I can’t get distracted. But at the same time it’s total coolness inside. I feel complete serenity and robot calmness while healing. I don’t know why :) But it’s relaxing. Grats to Aurinko, and glad you had fun on your first outings healing! Ha! Healing can be fun, it sure can. While, I agree, the first impressions can be to tunnel on the health bars; after a while at healing, you do see the fights — just differently, I guess.